Voted one of the top 10 things to do while in Las Vegas by Time Magazine, Shark Reef inside Mandalay Bay Hotel & Casino is a must-see while visiting Sin City. 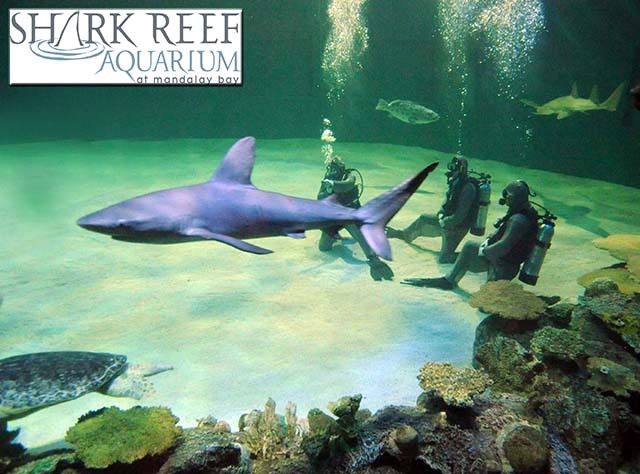 The only accredited institution by the American Zoo and Aquarium Association in Nevada; Shark Reef is a favorite among tourists and marine experts alike. Home to more than 2,000 animals and 100 different species of aquatic life, the 100,000-plus-square-foot facility features 14 amazing exhibits devoted to a variety of sea predators, including 15 species of sharks, tropical and fresh water fish, reptiles, marine invertebrates and stingrays. Your discount Las Vegas Shark Reef tickets offer you the opportunity to experience one of the largest aquatic exhibits in North America. The 1.3 million gallon tank, which is designed to look like a shipwreck, features a 360-degree view of some of the underwater world’s most mesmerizing creatures. The acrylic tunnel is home to several species of sharks, endangered sea turtles, stingrays, sawfish, and many other aquatic creatures. In addition to the shark tunnel, Shark Reef features several other exhibits, including crocodiles, Komodo Dragon, piranhas, jellyfish, Caribbean reef, Amazon predators, venomous fish and many more. One of the most popular attractions is the Touch Pool. The 2,500-gallon saltwater interactive touch exhibit offers guests the opportunity to touch an ever-changing selection of animals such as stingrays, sharks and horseshoe crabs. Get your discount Las Vegas Shark Reef tickets from VEGAS (the app) today for a total sensory experience of the underwater world you won’t soon forget! Shark Reef & Aquarium Hours: 10:00 am - 8:00 pm Sunday - Thursday, 10:00 am - 10:00 pm Friday & Saturday. Summer Hours: (May 24 - Sept. 1) 10:00am - 10:00pm everyday.